A 25-year-old lady presented with burning, well-circumscribed, red scaly rash with fine fissures involved the chin of 5 days duration. The patient gave history of applying a topical cream containing Tretinoin + Hydroquinone + Mometasone, two days after she developed this rash. Tretinoin was the most suspected culprit. Stopping this topical preparation and twice daily application of Betamethasone valerate ointment gave dramatic improvement. A young adult female developed blistering erythematous zoster-like rash on the lower part of the face and neck 24 hours after spraying a newly-used perfume on the affected sites. A middle-aged woman diagnosed with actinic cheilitis and for which 5-FU cream had been prescribed. One week later she presented with severe oozy and crusted dermatitis reaction involving the lips and surrounding perioral region. The 5-FU ointment had been stopped and topical steroid was advised. 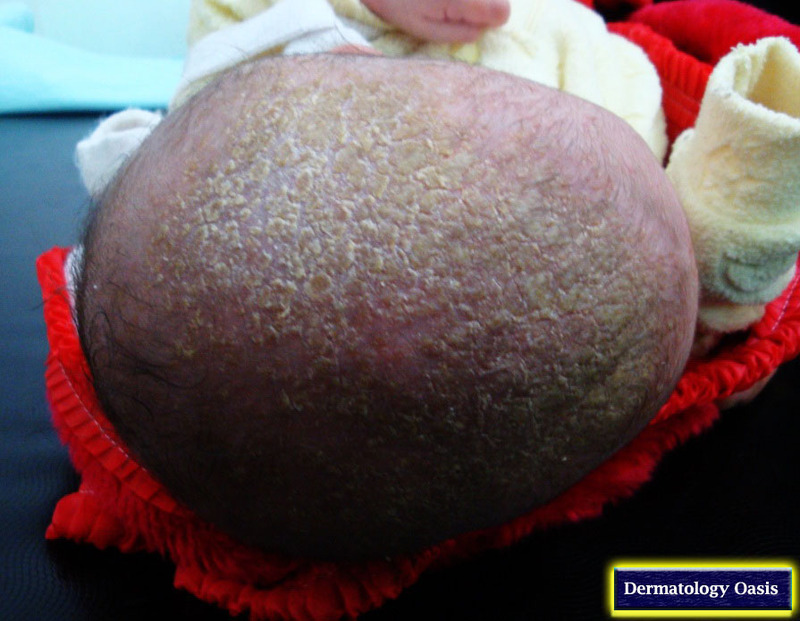 A 3-month-old male infant presented with thick yellow greasy scales and crusts overlying erythematous scalp, forehead and eyebrows. The condition had been noted since birth. A young lady presented two weeks after a professional-made tattoo on the dorsal surface of the hand with red tattoo reaction. The reaction was in form of pruritic scaly dermatitis confined to the red portion of the tattoo. Cinnabar (mercuric sulfide) or mercury is the pigment used to give the red color of tattoo and the red tattoo is the most common cause of delayed allergic reaction in tattoos. A 40-year-old man suffered frequent episodes of very pruritic, deep-seated, thick-roofed vesicles and bullae confined to the palms of both hands within last three years. Most exacerbations occurred at hot summer months. Each attack persists for three to four weeks and resolutes. A classical subacute red scaly dermatitis involved both cheeks associated with irritability in a two months old infant. Family history of atopy was positive.